As summer approaches, the days get longer, the weather gets hotter and your energy costs start to rise. With smart automation in your Stamford or Greenwich business, you can beat the heat. Motorized shades are among the most efficient, effective and often-times beautiful ways of keeping your spaces cool and comfortable any time of the year. Read on to find out how motorized shades can improve your working environment, whether your work in an office, a restaurant or in the hospitality industry. The late afternoon sun coming in through the windows of your boardroom can be distracting, especially if you are trying to conduct a meeting. Warm, uncomfortable employees can feel fatigued and the bright sun can wash out the images on your presentation. Motorized shades, combined with the proper fabric, can keep the sun out and the temperature down saving you electricity while maintaining a comfortable environment. They can even automatically adjust to the changing position of the sun to save even more electricity while reducing glare and heat gain. 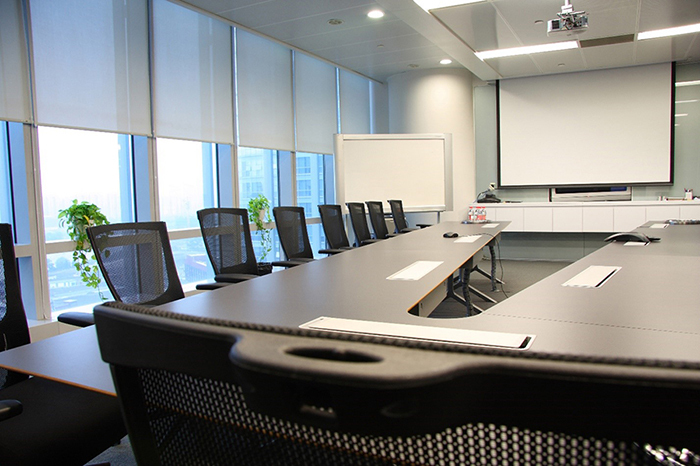 Integrate your shading with the office lighting and audio / video systems, so that you don’t have to waste time prepping the boardroom for your next meeting – you can control it all with just one button. Imagine your dining room is full on a Sunday morning, customers are enjoying brunch in the outdoor seating area, but there’s just one problem: the bright sun is making the mimosas sweat and burning patrons’ necks. But with one button, anyone on your wait staff can adjust the shading so that everyone is cool and comfortable so they’ll spend more time savoring their meal. Let your shades and automated lighting system set the correct mood exactly as you want it every day. In a hotel room, there is a certain level of autonomy expected by your guests. They’ll want to be able to control the lighting and shading in their own room as much as possible for a restful stay. Accommodate them with motorized shades integrated into the lighting and climate system so that they can have simple, easy controls located at a central location on the wall. Whether your guest is there for a night or for a week-long vacation with the family, they’ll appreciate the level of control they have during their break. Are you ready to get motorized shades in your Stamford, CT or Greenwich, CT business? Contact us to get started today.